Commitment to Purpose means we're engaged in Mission supported by Values grounded in the biblical truth of God's Revelation to man. To fulfill our purpose we must engage our world, reaching out to our community in love, willing to serve, and committed to extending grace to others as God has been gracious to us. The symbolism of the abstract cross might seem unclear at first, but if you'll take a closer look you will see that at the center is the sun risen with healing in his wings. 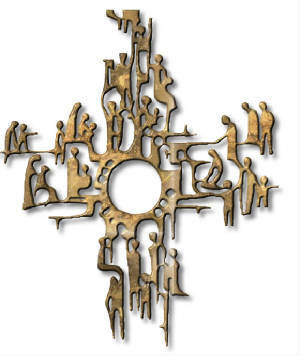 The arms of the cross are made up of all manner of people in need - some in wheel chairs, some on crutches, some alone on bended knee, and others with children in hand. The promise from Malachi 4.2 is that in the day of testing and trial, those who honor God will find, in the Lord Jesus (the Sun of Righteousness), liberty and rest, blessing and peace, healing and hope. * We believe that God's Word is sufficient to meet the need for direction and purpose in our lives. * We believe that by God's Grace alone we have victory over the trials and failures of life. * We believe that we are called to live according to the example of Jesus Christ, and thereby be an example to others. * We are committed to worshiping God as a group in ways that are both up-lifting and edifying. * We are committed to individual and corporate study, that we might grow in our knowledge and understanding of God and His Word. * We are committed to staying on task, rooted in faith, daily fulfilling the mission to which God has called us. * We are committed to praying for one another, for the people around us, and for the growth of God's Church. * We are committed to bringing up our children (the next generation), by instruction and example, to be genuine followers of our Lord Jesus Christ. I. The Holy Bible was written by men divinely inspired and is God's revelation of Himself to man. It has God for its author, and salvation for its end. All Scripture is totally true, trustworthy, and sufficient. All Scripture is a testimony to Christ, who is Himself the focus of divine revelation. II. There is one and only one living and true God. He is the Creator, Redeemer, Preserver, and Ruler of the universe, worthy of all glory, honor and praise. The eternal triune God reveals Himself to us as Father, Son, and Holy Spirit, with distinct personal attributes, yet without division of nature, essence, or being. III. Christ is the eternal Son of God. In His incarnation as Jesus Christ He was conceived of the Holy Spirit and born of the virgin Mary. By His substitutionary death on the cross He made provision for the redemption of men from sin. He was raised from the dead, ascended into heaven and is now exalted at the right hand of God. He is the One Mediator, able to sympathize with our weakness, having been tempted as we are, yet without sin. He is fully God, fully man, in whose Person is effected the reconciliation between God and man. He will return in power and glory to judge the world and to consummate His redemptive mission. IV. The Holy Spirit is fully divine. He inspired holy men of old to write the Scriptures. Through illumination He enables men to understand truth. He exalts Christ. He convicts men of sin, of righteousness, and of judgment. He calls men to the Savior, and effects regeneration. At the moment of regeneration He baptizes every believer into the Body of Christ. He cultivates Christian character, comforts believers, and bestows the spiritual gifts by which they serve God through His church. He seals the believer unto the day of final redemption. His presence in the Christian is the guarantee that God will bring the believer into the fullness of the stature of Christ. He enlightens and empowers the believer and the church in worship, evangelism, and service. V. Man is the special creation of God, made in His own image. Through the temptation of Satan, man chose to transgress the command of God, and fell from his original innocence, incurring both physical and spiritual death. Only the grace of God can bring man into His holy fellowship and enable man to fulfill the creative purpose of God. VI. Salvation involves the redemption of the whole man, and is freely bestowed on all who accept Jesus Christ as Lord and Savior. In its broadest sense salvation includes regeneration, justification, sanctification, and glorification. There is no salvation apart from personal faith in Jesus Christ as Lord. Election is the gracious purpose of God, according to which He regenerates, justifies, sanctifies, and glorifies sinners. All true believers endure to the end. Those whom God has accepted in Christ, and sanctified by His Spirit, will never fall away from the state of grace, but shall persevere to the end. Believers may fall into sin through neglect and temptation, whereby they grieve the Spirit, impair their graces and comforts, and bring reproach on the cause of Christ and temporal judgments on themselves; yet they shall be kept by the power of God through faith unto salvation. VII. A New Testament church of the Lord Jesus Christ is an autonomous local congregation of baptized believers, associated by covenant in the faith and fellowship of the Gospel; observing the two ordinances of Christ: Baptism and the Lord's Supper; governed by His laws, exercising the gifts, rights, and privileges invested in them by His Word, and seeking to extend the Gospel to the ends of the earth. The New Testament speaks also of the universal church, the Body of Christ, which includes all of the redeemed of all the ages, believers from every tribe, and tongue, and people, and nation. VIII. Every human being has direct relations with God, and is accountable before God alone in all matters of faith, his conscience being free from the doctrines and commandments of men which are contrary to Gods Word or not contained in it. A Christian should conduct himself for the glory of God and the well-being of his fellow men. His behavior should be above reproach, blameless before the world. He should be a faithful steward of his possessions, and he should seek to realize for himself and others the full stature of maturity in Christ. IX. The local church is independent and must be free from interference by any ecclesiastical or political authority. Therefore, Church and State must be kept separate as having different functions, each fulfilling its duties free from dictation or patronage of the other. X. God, in His own time and in His own way, will bring the world to its appropriate end. According to His promise, Jesus Christ will return personally and visibly in glory to the earth; the dead will be raised; and Christ will judge all men in righteousness. The unrighteous will be consigned to Hell, the place of everlasting punishment. The righteous in their resurrected and glorified bodies will receive their reward and will dwell forever in Heaven with the Lord. XI. Marriage is an ordinance of God, instituted at the time of creation, affirmed by Jesus Christ, and defined as the covenant union of one man and one woman for life. Human sexual intimacy is a gift from God, for companionship and procreation, to be received with thankfulness, and practiced joyfully, in the confines of a monogamous marriage between a man and a woman. Singleness is also a gift from God, in which one is called to a celibate life while enjoying fullness of life in the Kingdom. Any and all sexual activity outside the covenant of marriage as so defined is sin. Furthermore, children are a blessing from the Lord, and thus all human life is sacred and worthy of protection from the moment of conception until natural death.